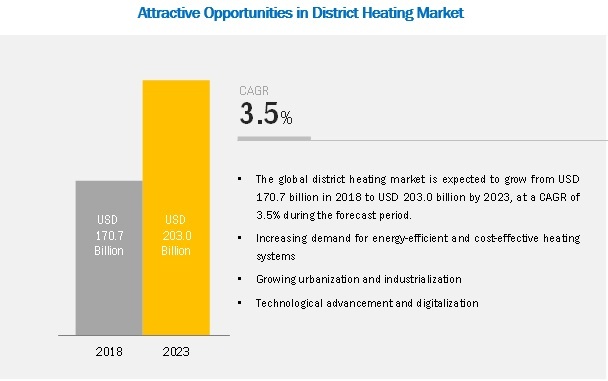 [113 Pages Report] The district heating market is expected to grow from USD 170.7 billion in 2018 to USD 203.0 billion by 2023, at a compound annual growth rate (CAGR) of 3.5% during the forecast period. The study involved 4 major activities to estimate the current market for district heating. Exhaustive secondary research was done to collect information on market, peer market, and parent market. The next step was to validate these findings, assumptions, and sizing with industry experts across value chain through primary research. Both top-down and bottom-up approaches were employed to estimate the complete market. Thereafter, market breakdown and data triangulation were used to estimate the market of segments and subsegments. In the secondary research process, various secondary sources such as Hoovers, Bloomberg BusinessWeek, and IEA, Euroheat & Power have been referred to, so as to identify and collect information for this study. These secondary sources included annual reports, press releases and investor presentations of companies, white papers, certified publications, articles by recognized authors, gold standard and silver standard websites, regulatory bodies, trade directories, and databases. After arriving at the overall market size using the market size estimation processes as explained above the market was split into several segments and subsegments. To complete the overall market engineering process and arrive at the exact statistics of each market segment and subsegment, the data triangulation and market breakdown procedures were employed, wherever applicable. The data was triangulated by studying various factors and trends from both demand and supply sides in residential, commercial, and industrial applications. Total 20 major players covered. This research report categorizes the district heating market by heat source, plant type, application, and region. The district heating market is expected to grow from USD 170.7 billion in 2018 to USD 203.0 billion by 2023, at a compound annual growth rate (CAGR) of 3.5% during the forecast period. Increasing demand for energy-efficient and cost-effective heating systems and growing urbanization and industrialization are the major factors driving the growth of the district heating market. Natural gas is used for district heating, space heating, and domestic hot water, as well as for cooking. This fuel can also be used in centralized systems for the production of comfort heating with absorption machines that use natural gas to create hot steam. It is used in majority of boilers during peak loads. The efficiencies are typically in the range of 97–105% based on net calorific values. Moreover, with natural gas heat being easily produced, it is therefore used for backup capacity in district heating systems. Combined heat and power (CHP) refers to the plant that is designed to generate power and heat in a single, integrated system. The heat that is normally wasted in conventional power generation plant is recovered as useful energy. Rejected heat is recovered to create steam or hot water to heat a surrounding network of buildings through a district heating system. By utilizing the thermal byproduct of electric production, CHP plants regularly see fuel efficiencies of 70–85% or higher, which results in holding a major share of the district heating market. Residential applications include single-family houses and apartments (hotels, buildings, and multi-housing). The adoption of district heating in single-family houses is lower than that of apartments due to the cost-effectiveness of other heating options. In addition, the development of smart home applications play a major role in increasing the demand for district heating. The innovation and adoption of new techniques in smart homes have boosted the growth of this market, especially in developing countries. The district heating market in APAC is growing at the highest, and the same trend is expected to continue in the coming years. Dense population and growing per capita income in this region, along with government initiatives, are the major factors driving the growth of the market in this region. 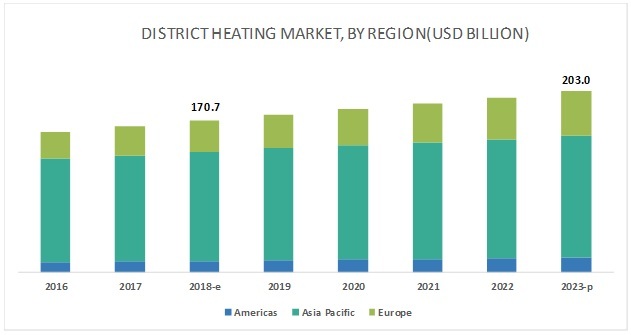 With increasing demand for thermal comfort, achieving energy efficiency, continuous increase in the number of households connected to district heating, and reducing greenhouse gas emission, the market for district heating is expected to rise in the coming years. Moreover, rapid urbanization in the country and government initiatives to adopt district heating systems is propelling the growth of the district heating market. Fortum (Finland), Vattenfall (Sweden), Engie (France), Danfoss (Denmark), NRG Energy (US), Statkraft (Norway), Shinryo Corporation (Japan), LOGSTOR (Denmark), Vital Energi (UK), Kelag (Austria), Goteborg Energi (Sweden), FVB Energy (Canada), Alfa Level (Sweden), Ramboll (Denmark), Savon Voima (Finland), Enwave Energy (Canada), Orsted (Denmark), Helen (Finland), Keppel DHCS (Singapore), and STEAG New Energies (Germany) are among the major players in the district heating market. Fortum is one of the leading companies operating in the clean-energy generation segment that offers electricity, heating, and cooling, as well as smart solutions to improve resource efficiency. The company primarily focuses on building cleaner heating sources, improving resource efficiencies, and providing smart solutions. The district heating solutions provided by the company are energy-efficient and also emits less CO2 than alternative heating solutions. In October 2017, the company won an award from Global District Energy and Climate Award 2017 for sustainable expansion of district heating and cooling systems. Moreover, the company adopted partnerships and collaborations as growth strategies to increase its market presence in the global district heating market. Vattenfall is one of the leading district heating service providers for residential and commercial consumers located in Denmark, Finland, France, Germany, the Netherlands, Sweden, and the UK. The company focuses on providing safe and reliable district heating solutions having efficient resources and low CO2 emission. To use heat sources efficiently, the company procures surplus heat or waste heat from third parties, including industries and data centers. Moreover, the company uses heat from different heat sources including wind power, biomass, hydro, natural gas, nuclear power, coal, and solar. In March 2018, Vattenfall installed new smart heat meters for the district heating system in Berlin. The new smart meters have precise control that helps in optimum utilization of fuel to reduce CO2 emission. In July 2017, Engie inaugurated the biomass boiler unit of Saint-Danis, the second largest district network of Ile-de-France. This new boiler will help in reducing CO2 emission in Ile-de-France. In December 2017, NRG Energy partnered with Cummins (US) to deploy a resilient, cleaner, and cost-effective distributed energy platform for residential, commercial, and industrial customers. The new platform will enhance the energy usage through smart energy consumption model. Which are the major heat sources used for providing district heating? What are the strategies followed by district heating providers to stay ahead in the district heating market? In which application district heating is widely used? What are the drivers, opportunities, and challenges in the district heating market?